Note: If the print is one-way and runs crosswise, or if it is multi-directional, use these instructions. If it is one-way and runs lengthwise of the fabric, use special cutting directions for the print at the *** below. From print fabric, cut 1 strip 5.5” wide. Subcut 4 strips 4.5”; this will provide 4.5” x 5.5” pieces for the short ends. 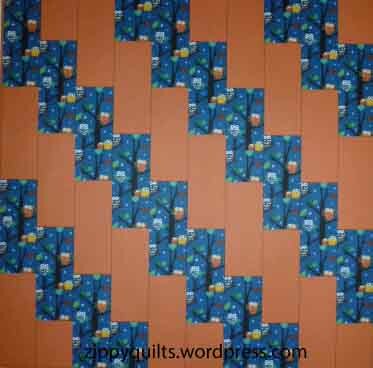 From solid fabric, cut 6 strips 4.5” x WOF. Subcut 17 pieces 4.5” x 10.5” and 6 pieces 4.5” x 5.5”. Assembly: Lay pieces out as shown in picture to make vertical strips 4.5″ wide. Join strips along the long edges in the order shown. Use leftover fabric as part of the back or binding if you want. Quilt and bind as desired, then send me a picture!